Maximise the performance of your high-quality DSLRs and HD video cameras. 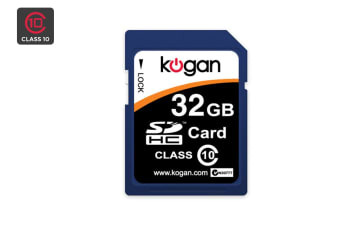 With 32GB of storage, the Kogan 32GB SDHC Class 10 Memory Card lets you get the most out of your DSLRs and HD video cameras as long as they support the SDHC format. With speed and reliability that specifically caters to Full HD video recording, the Kogan 32GB SDHC Class 10 Memory Card enables your ultra-high quality DSLR cameras to shoot quickly and continuously. The quality of the product was no different to other more expensive brands.